In Jason Reitman’s Men, Women & Children the only value J.K. Simmons’ character has is as a peripheral reference to his far more engaging role in Reitman’s earlier film, Juno. In Damien Chazelle’s Reitman-produced Whiplash, however, Simmons has been gifted his ideal role, and he gives back in spades. Simmons is Terence Fletcher, a well-respected teacher of the most promising students at the fictional Shaffer Conservatory of Music, New York (a setting which both recalls the iconic Fame, and perhaps makes Shaffer a cipher for Juilliard). To say Fletcher’s teaching methods are unconventional really doesn’t cut it; he’s both verbally and physically abusive, and above all, a master manipulator. 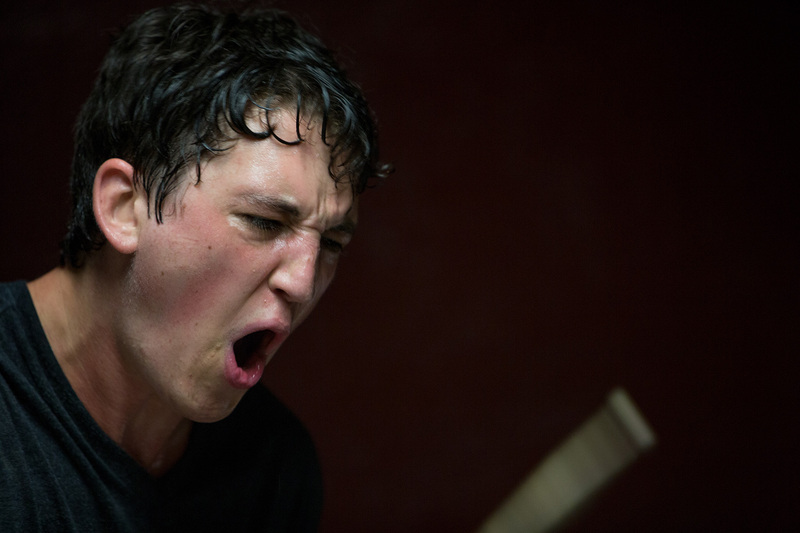 As is Chazelle, who throughout his screenplay continually crafts Fletcher as monstrous, but never quite allows us to hate him despite his psychological torture of jazz drummer and protagonist Andrew (Miles Teller). Terrence Fletcher feels like the J.K. Simmons role you didn’t know you were waiting for, and Teller’s performance, too, couldn’t come at a more welcome moment. After an impressive and underseen debut in 2010’s Rabbit Hole, a plethora of supporting roles in teen films such as Divergent and the Footloose remake, plus a charismatic turn in The Spectacular Now, Teller is fully deserving of this higher-profile leading role. And boy does he deliver. Julianne Moore’s much-discussed facial contortions in David Cronenberg’s Maps to the Stars are here upstaged by both Teller and Simmons, both of whom appear utterly demonic at times. A muscled Simmons brings a menacing physicality to Fletcher, while the focus Teller brings to Andrew’s drumming, while never enough for his taskmaster of a teacher, makes watching feel like an invasion of a private and intimate act. 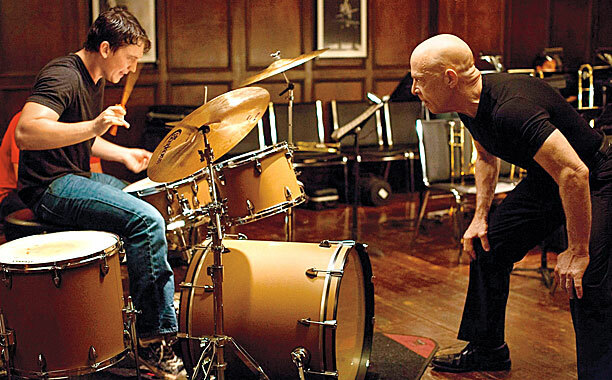 The persistent drum score of Alejandro G. Iñárritu’s Birdman, a comparable film about performance, desperation, and demons, is also upstaged by Whiplash’s percussion. 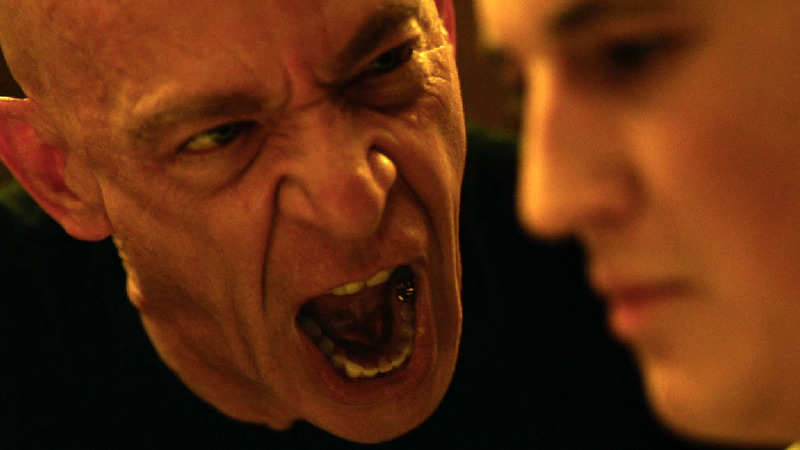 From its opening beats Whiplash becomes an increasingly tense watch, with the unpredictable development of Fletcher and Andrew’s relationship continually providing the core engagement. Yet this is not a one-note film. Although the most thrilling and disturbing scenes take place in practice rooms and on stages, Andrew’s life as an isolated student is also authentically conveyed. This is not the New York we’re used to seeing in the movies; no-one hails a taxi, there’s no sweeping shot over Ellis Island and the Statue of Liberty – we don’t even glimpse the subway. Instead, Andrew’s New York, like his drumstick-weathered hands, is rough and worn. Tension builds unceasingly, with Chazelle’s narrative coming to resemble a drum skin being tightened. The hard-hitting final act appears to give Fletcher his comeuppance, but refuses to draw a neat line under the struggle of the film’s two personalities by offering debate as to whether Fletcher has still remained a step ahead of Andrew. 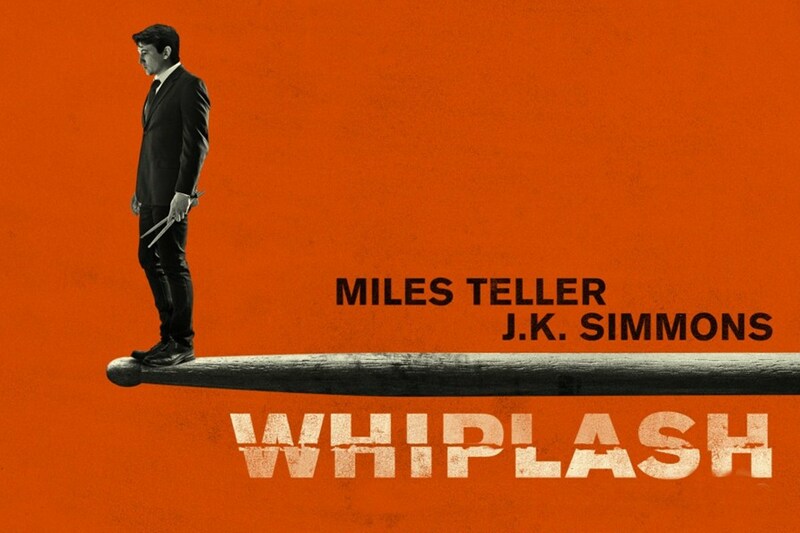 Whiplash is released on Friday 16th January. This entry was posted in Film Reviews and tagged Alejandro G. Inarritu, Birdman, Damien Chazelle, David Cronenberg, Divergent, Fame, Footloose, J.K. Simmons, Jason Reitman, Julianne Moore, Juno, Maps to the Stars, Men Women & Children, Miles Teller, Rabbit Hole, The Spectacular Now, Whiplash. Bookmark the permalink. Who is Monsters University aimed at?